Among the many of the EPA’s extremist crusades worthy of a religious fanatic is its regulatory juggernaut against particulates (or “particle pollution” as EPA renamed it a few years ago). The epidemiology of particulates is stronger than for some other forms of air pollution toward which the EPA is ultimately moving toward a zero emission standards (such as ozone), but a closer look shows how unrealistic the EPA’s goals have become. The map below shows the western counties that are non-attainment areas for PM10 (particulates of 10 microns in size or smaller), and it shows a number of rural counties that don’t meet the standard, but which are home to little or no industry at all. In other words, the sources of high particulate levels in these counties are entirely natural—dust blowing off the ground. 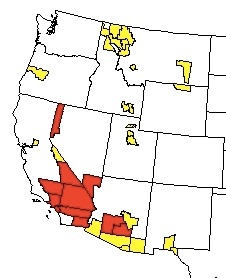 Is the EPA going to require Inyo County, California, to install county-wide sprinklers to tamp down dust? We estimate that the mass of aerosols arriving at North American shores from overseas is comparable with the total mass of particulates emitted domestically. Curbing domestic emissions of particulates and precursor gases, therefore, is not sufficient to mitigate aerosol impacts in North America. The imported contribution is dominated by dust leaving Asia, not by combustion-generated particles. Thus, even a reduction of industrial emissions of the emerging economies of Asia could be overwhelmed by an increase of dust emissions due to changes in meteorological conditions and potential desertification. The implication is clear: the U.S. could move to zero emissions of particulate-forming aerosols, and still fail to attain the PM standards. Which means we will be imposing costs for little or no benefit (but that’s a feature rather than a bug for EPA fanatics). Maybe, my pal Ken Green suggests, we should turn all of those windmills around and have them blow back against Asia.